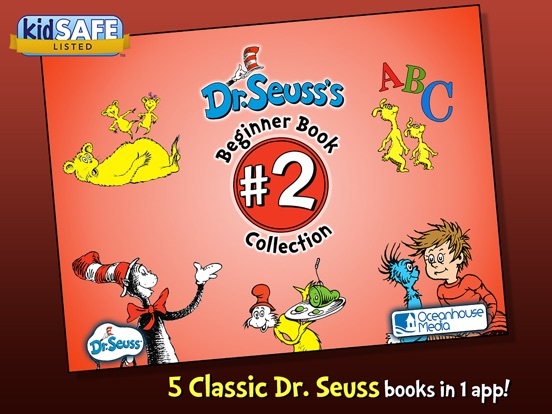 Dr. Seuss Beginner Book Collection #2, by Oceanhouse Media, is the second such collection of Dr. Seuss books. In this collection you will find five favorites such as Hop on Pop, The Cat in the Hat Comes Back, ABC, There’s a Wocket in My Pocket and Green Eggs and Ham. Hop on Pop: contains simple rhyming words presented in silly ways. The Cat in the Hat Comes Back: the Cat returns causing more mischief with the help of new friends. 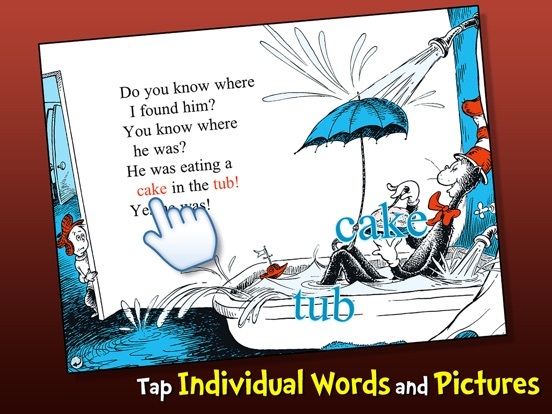 Dr. Seuss ABC: kids learn the ABCs with Seussian words and illustrations. There’s a Wocket in My Pocket: a story about a boy and the imaginary creatures that live with him. 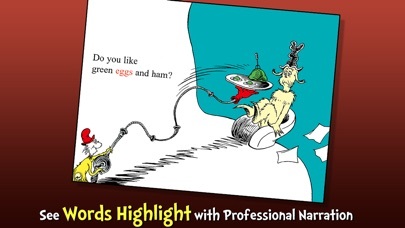 Green Eggs and Ham: Sam-I-Am tries to share his meal using all sorts of methods to convince his friend to try it. The developers have done a great job making it easy to move from book to book. 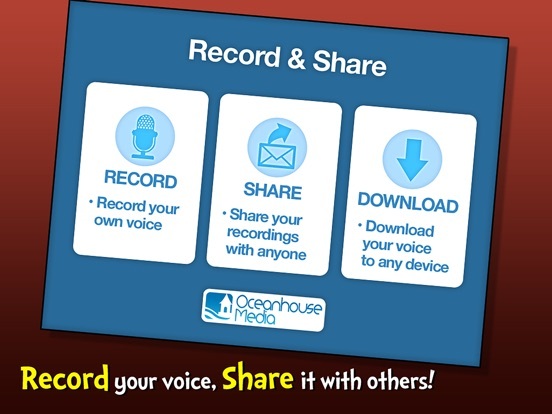 Each book has three choices for reading the book; read it myself, read to me and auto play. All five books have two features that are ideal for early readers; text highlighting while the story is narrated and the ability for the reader to touch words and pictures to hear the word spoken, which helps build word association. The narration is crisp and clear, easy to understand; some books have a female narrator and others, a male voice. Sounds and background music are nicely done, adding to the story, but not overpowering the narrator. Sound effects can be muted in the information menu. If you need to stop reading in the middle of one of the books, you can exit the story and upon returning it will prompt you to start over or resume. If you do not already have one of these five Dr. Seuss beginner books, this is a great way to purchase them. 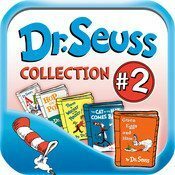 We have many of the beloved Dr. Seuss books in hard copy so I look forward to including them in our digital library also. 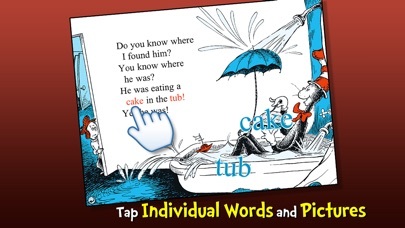 Dr. Seuss Beginner Book Collection #2 is a universal app which plays well and is easy to use on either device. The file size was reasonable and did not overwhelm our devices, considering it contains five full books, animation and all. 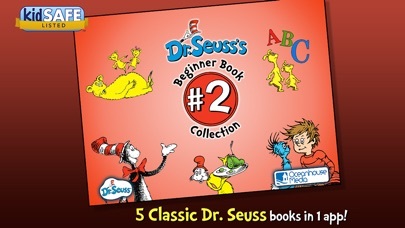 The Dr. Seuss Beginner Book Collection #2 contains five exciting Dr. Seuss titles for young readers. 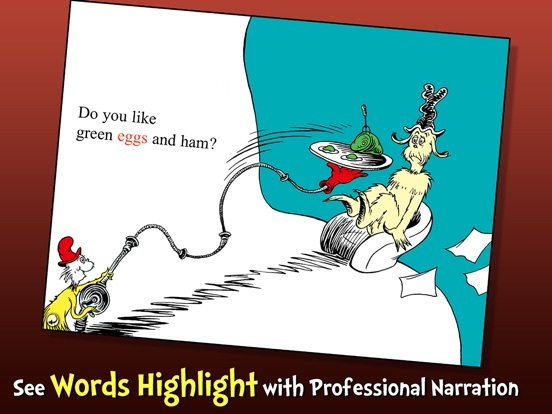 Enjoy Green Eggs and Ham, Dr. Seuss’s ABC, The Cat in the Hat Comes Back, There’s a Wocket in My Pocket! 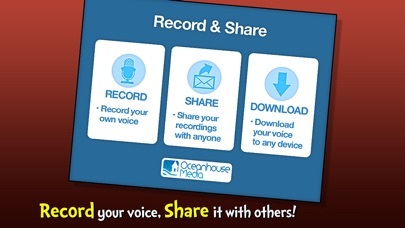 and Hop on Pop all in one omBook!